We went to Apple Day at Kehelland at the weekend – always a great day out. Afterwards we took a trip out to Godrevy to see the sea and feel the wind on our faces. We also had very scrummy rock cakes at The Rockpool (how fitting). Godrevy is on the northern point of St Ives bay and is maintained by the National Trust. There’s a sandy cove with rocks to climb, a lighthouse out on an island and you might see some seals – plenty to keep little people (and big people) entertained. We’ve usually ended up going in the winter so I think of crashing waves and cold winds. I remember a time when were properly sandblasted here one day with the grandparents when I was pregnant with Eldest, and one Christmas Eve a few years later when I shut his head in the car boot and we ended up at the MIU. (Sorry family). In a less eventful visit we pottered down on the beach, exploring cracks and caves in the rocks and saw the grey seals and their pups at Mutton Cove. The seal colony is here throughout the year. From late autumn to Jan/Feb you might see them on the beach with their pups. The Cornish Nature website has a great page about the seals. Here’s some more information about Godrevy and the beaches. I find the lighthouse on the island captivating. I love to think of the people that have lived there. The cottages and the surrounding wall seem to speak of domesticity – a wall for keeping animals (or children?!) in. It’s said that Godrevy was the inspiration for Virginia Woolf’s ‘To The Lighthouse’. It was first built in 1859 and it was ‘kept’ by light house keepers until 1939 when it became automatic. It’s now solar powered and the light has been moved to a steel structure on the island, but the white tower still serves as the emblem of safety and protection. Parking: National Trust car park at Godrevy, either down near Gwithian Towans beach, or further up the road in the grassy area nearer to Godrevy beach. Toilets: In the cafes. Public toilets on the headland, seasonal opening. Cafe: There is a cafe on the NT car park at Godrevy, and The Rockpool (previously the Sandsifter) accessible from the NT car park or from the road. Time: Up to Mutton Cove and back at a slow wander – about an hour. You don’t need many. 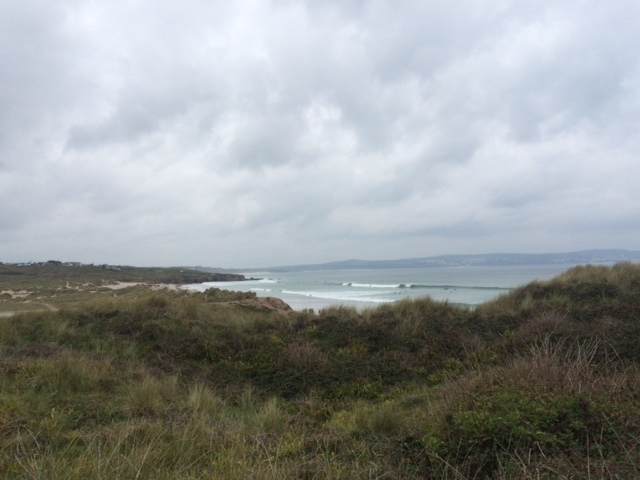 From the NT car park there are wooden footways over the dune to Gwithian Towans beach where you might see lots of surfers in the water. Here you can turn left and follow the Red River to the Rockpool bar. To Godrevy beach from the car park, follow the path bedside the road with the sea on your left. There is a path down to the beach along here, or follow the path on towards the light house and across the headland to Mutton Cove to see the seals (shh – be quiet up here). You can continue on here to Deadman’s Cove but we’ve not managed to get that far yet. It does get windy up here. Bring a hat and hang on to it. And don’t shut anyone’s head in the car boot.